Qantas A380 seating plan - A388, International 14F 64J cabin layout - seat pictures & colour interactive A380 seat map, review of best seats in economy, business & first class. This seat map is for the Airbus A380-800, the flagship of Qantas Airlines. Called the Superjumbo, it is the largest, most comfortable, and quietest airliner in the world. It is definitely the long-haul aircraft of choice in all three classes, with up to date in-flight entertainment & the newest seats. QF A380 Routes: Qantas Sydney & Melbourne to Singapore London, Hong Kong, LA. If you're flying in the Roo, the Airbus A380-800 Superjumbo is the plane you want to be on. It is the flagship of Qantas Airways. The Qantas A380 seating map has First Class in the nose of the plane, where it is very quiet, and then acres of economy seats, designed by Marc Newson, which are notorious for eye-popping colours - red in the front economy cabin, then green & finally orange. The cabins will never win any awards for originality, instead recycling a dull format, but all Qantas A380 seats have seatback TV & AVOD, lumbar support and a headrest with adjustable wings. Power ports are by the footrest, with a USB port in the armrest. A unique feature are the self-service snackbars dotted around the economy cabin. ►Hover mousepointer over a seat for Qantas Airlines A380 seat pictures, and a description of that seat. Seatback TVs in all classes on Qantas A380, with AVOD (start,stop,pause) showing 100 films, and 500 TV programmes. Lounges: Qantas have Qantas Club lounges for members at most airports. These lounges have free food and drink with a complementary bar. Seat prebooking: You can book your seat on Qantas Airlines A380 before the flight. Online Checkin: Qantas Airlines have full online check-in from 24 hours before the flight. There are twelve A380 in Qantas fleet, with registations VH-OQA, VH-OQB, VH-OQC, VH-OQD, VH-OQE, VH-OQF, VH-OQG, VH-OQH, VH-OQI, VH-OQJ, VH-OQK and VH-OQL. 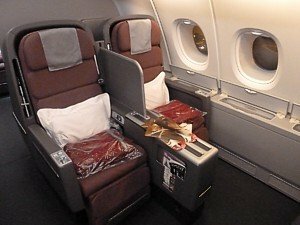 In economy the best seats on the Qantas A380 are normally regarded as 51A & K, and 66A & K, however these Qantas A380 best seats are normally reserved for Qantas' most frequent flyers. Qantas operate: QF31/QF32 A380 Sydney to London LHR via Singapore. QF11/QF12 A380 Sydney to Los Angeles LAX. QF9/QF10 Melbourne to London LHR via Singapore. QF93/QF94 Melbourne to Los Angeles. 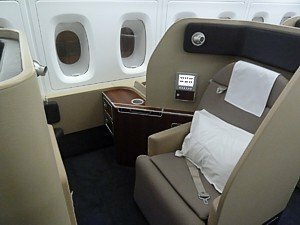 The Qantas A380 Business Class seating map is in a 2-2-2 layout, with the Skybed: a lie-flat sleeper seat, 80" long, 21.5" wide, which reclines to within 8 degrees of horizontal, within semi-circular cocoon. Each seat has computer power ports, three lights (overhead, over-shoulder reading, and touch-activated on top of the cocoon), and a 10.4" TV on the seat back infront. There's even a storage compartment next to the window. Qantas A380 Premium Economy Class is marketed as "Business Class lite", and is actually pretty decent, in a 2-3-2 layout, and with large luggage bins under the windows. There's no lounge access, and only economy food, but the legroom is great. Food: Qantas Airlines have a great reputation for inflight food, and serve complementary drinks (Free beer, wine and spirits). Business and first class passengers may also choose to use the "Book the Cook" service where specific dishes may be selected in advance from an extensive menu. 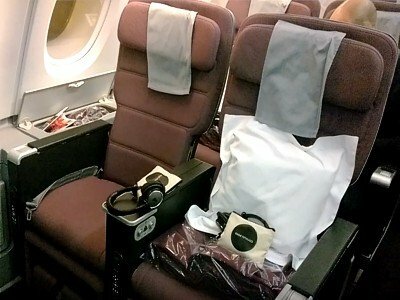 Seatback TVs in all classes on Qantas A380, with KrisWorld AVOD (start,stop,pause) showing 100 films & 180 TV programmes. Lounges: Qantas have Business Class lounges at most airports, and First Class lounges at main hubs. In business the best seats on the Qantas A380 are normally regarded as being the front row of the mini-cabin in row 24, so long as you don't mind being served your meal last. 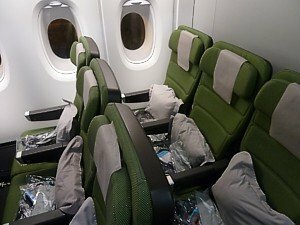 For those who want quicker service, row 11 is generally favoured, however these Qantas A380 best seats are normally reserved for Qantas' most frequent flyers.